• Send you our newsletters. 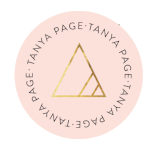 If you do not want us to use your information for marketing purposes, contact us directly by emailing tanya@tanyapage.com Please be advised that we DO NOT store the credit or debit card details of any of our customers. We may disclose your personal information to any of our group companies and/or to third parties in the following circumstances: to any prospective seller or buyer of all (or part of) our business or assets; if we are required to do so by law, any applicable regulation or to protect the rights, property, or safety of ourselves or others. This may include disclosing to other companies and organizations in connection with fraud protection and credit risk reduction.